I love chocolate chip cookie dough﻿. I've been known to make cookie dough and have no intentions at all to bake a single cookie. I'm not the only one in the household that sneaks spoonfuls of cookie dough either. I've walked in on Mr. Bites eating spoonfuls of cookie dough from a bowl while watching "The Notebook", uh, I mean, ESPN. I made these truffles for my mother-in-law for Mother's Day. She loves chocolate chip cookie dough more than anything and I knew she would love these. These truffles are egg-less, which makes it safe to eat raw cookie dough, however, I'm not really bothered by the egg. I'll still eat the dough. I'm a rebel like that. I'm not sure how many this recipe makes because, let's be honest, I sneak spoonfuls (surprise!). According to Lindsey, the original truffle recipe makes about 3-4 dozen 1-inch balls. Also, hop over to her blog and take a look at what she did with cookie dough and pie!! Beat butter and sugars and in a large bowl with electric mixer on medium speed until light and fluffy. Add milk and vanilla. Add flour, baking soda and salt and mix on low speed until incorporated. Stir in chocolate chips. Melt chocolate candy coating in a double boiler or in microwave according to package directions. 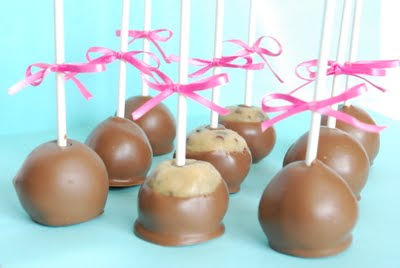 Insert sticks into cookie dough balls and then dip balls into melted chocolate, letting any excess chocolate drip back into the bowl. Return balls to wax paper to set up, or you can insert the stick into a Styrofoam base. Chill balls until set. You can store the truffles in an air tight container for up to one week. Shannon, these are SO cute! I love the presentation and the photo is top notch! Awesome job on these, Shannon! 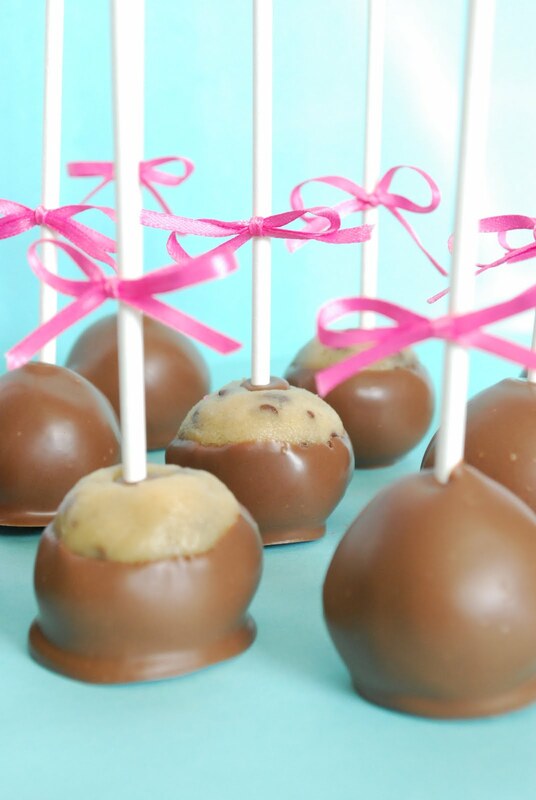 Those truffles are perfect and I love the pink ribbon! Beautiful presentation, they look delicious! I bet your MIL was so touched to get them. Well, these look just about perfect! This is genius! I love the pink bows. These were a huge hit! they flew off the plate. ADORABLE - thanks so much for sharing. I put them in cups instead of using the sticks because for some reason the sticks would not stay in. Not sure if anyone else had this issue but not a big deal at all :) thanks so much!!! Yum! What a great idea!!! I can't wait to try these! OK. These will be the first official sweets made in my new apartment. I just moved in last month and was planning to make Rice Krispies Treats first, but this just trumped that!! Tried this and they have utterly failed. For some reason the cookie dough would not set up. The sticks did not stay in. The cookie dough just came apart when I tried to dip in chocolate. I kept reading to see if I missed something, but I did not. I followed it perfectly. It did not go well. Any suggestions?